A form of machine learning called deep learning is one of the key technologies behind recent advances in applications like real-time speech recognition and automated image and video labeling. The approach, which uses multi-layered artificial neural networks to automate data analysis, also has shown significant promise for health care: It could be used, for example, to automatically identify abnormalities in patients’ X-rays, CT scans and other medical images and data. In two new papers, UCLA researchers report that they have developed new uses for deep learning: reconstructing a hologram to form a microscopic image of an object and improving optical microscopy. Their new holographic imaging technique produces better images than current methods that use multiple holograms, and it’s easier to implement because it requires fewer measurements and performs computations faster. 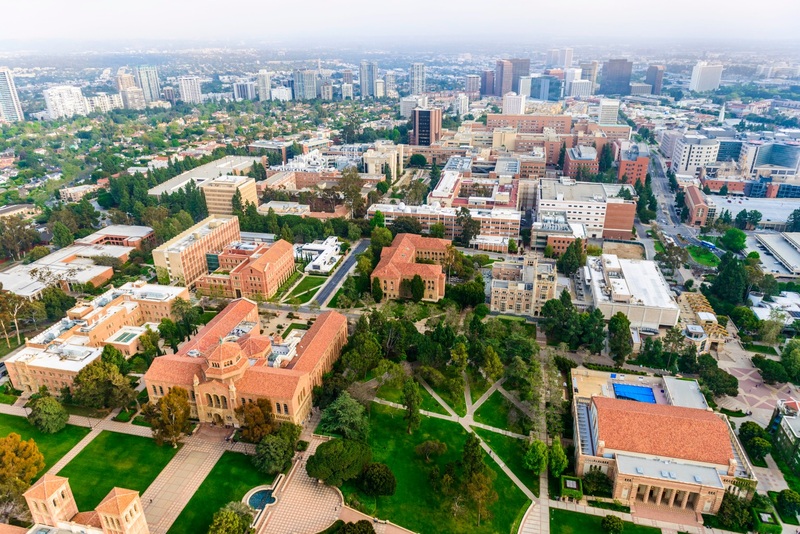 The research was led by Aydogan Ozcan, an associate director of the UCLA California NanoSystems Institute and the Chancellor’s Professor of Electrical and Computer Engineering at the UCLA Henry Samueli School of Engineering and Applied Science; and by postdoctoral scholar Yair Rivenson and graduate student Yibo Zhang, both of UCLA’s electrical and computer engineering department. For one study (PDF), published in Light: Science and Applications, the researchers produced holograms of Pap smears, which are used to screen for cervical cancer, and blood samples, as well as breast tissue samples. In each case, the neural network learned to extract and separate the features of the true image of the object from undesired light interference and from other physical byproducts of the image reconstruction process. 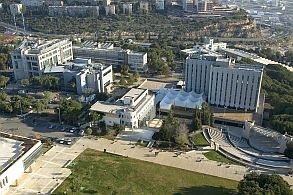 “These results are broadly applicable to any phase recovery and holographic imaging problem, and this deep-learning–based framework opens up myriad opportunities to design fundamentally new coherent imaging systems, spanning different parts of the electromagnetic spectrum, including visible wavelengths and even X-rays,” said Ozcan, who also is an HHMI Professor at the Howard Hughes Medical Institute. Another advantage of the new approach was that it was achieved without any modeling of light–matter interaction or a solution of the wave equation, which can be challenging and time-consuming to model and calculate for each individual sample and form of light. 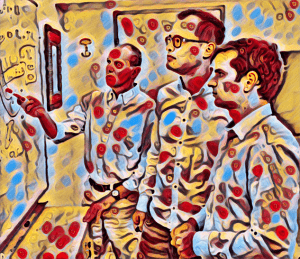 “This is an exciting achievement since traditional physics-based hologram reconstruction methods have been replaced by a deep-learning–based computational approach,” Rivenson said. Other members of the team were UCLA researchers Harun Günaydin and Da Teng, both members of Ozcan’s lab. The second study, published in the journal Optica, the researchers used the same deep-learning framework to improve the resolution and quality of optical microscopic images. 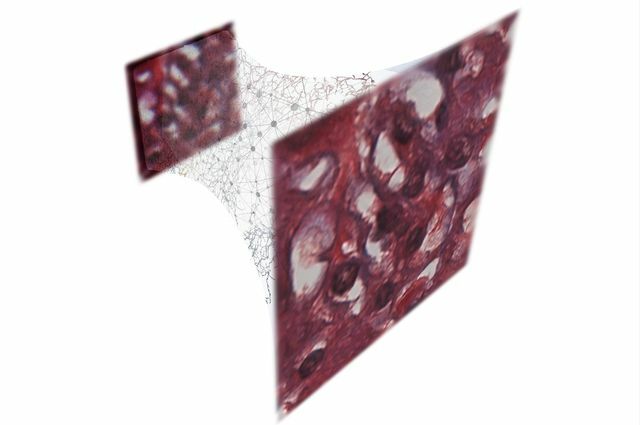 That advance could help diagnosticians or pathologists looking for very small-scale abnormalities in a large blood or tissue sample, and Ozcan said it represents the powerful opportunities for deep learning to improve optical microscopy for medical diagnostics and other fields in engineering and the sciences. Ozcan’s research is supported by the National Science Foundation–funded Precise Advanced Technologies and Health Systems for Underserved Populations and by the NSF, as well as the Army Research Office, the National Institutes of Health, the Howard Hughes Medical Institute, the Vodafone Americas Foundation and the Mary Kay Foundation. Stanford researchers say their algorithm could bring quick, accurate diagnoses of heart arrhythmias to people without ready access to cardiologists. Video by Kurt Hickman. We train a 34-layer convolutional neural network (CNN) to detect arrhythmias in arbitrary length ECG time-series. The network takes as input a time-series of raw ECG signal, and outputs a sequence of label predictions. The 30 second long ECG signal is sampled at 200Hz, and the model outputs a new prediction once every second. We arrive at an architecture which is 33 layers of convolution followed by a fully connected layer and a softmax. To make the optimization of such a deep model tractable, we use residual connections and batch-normalization. The depth increases both the non-linearity of the computation as well as the size of the context window for each classification decision. 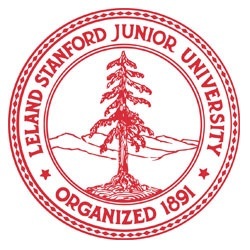 Stanford Machine Learning Group. We collect and annotate a dataset of 64,121 ECG records from 29,163 patients. Stanford Machine Learning Group. The ECG data is sampled at a frequency of 200 Hz and is collected from a single-lead, noninvasive and continuous monitoring device called the Zio Patch (iRhythm Technologies) which has a wear period up to 14 days. Each ECG record in the training set is 30 seconds long and can contain more than one rhythm type. Each record is annotated by a clinical ECG expert: the expert highlights segments of the signal and marks it as corresponding to one of the 14 rhythm classes. We collect a test set of 336 records from 328 unique patients. For the test set, ground truth annotations for each record were obtained by a committee of three board-certified cardiologists; there are three committees responsible for different splits of the test set. The cardiologists discussed each individual record as a group and came to a consensus labeling. For each record in the test set we also collect 6 individual annotations from cardiologists not participating in the group. This is used to assess performance of the model compared to an individual cardiologist. A new algorithm developed by Stanford computer scientists can sift through hours of heart rhythm data generated by some wearable monitors to find sometimes life-threatening irregular heartbeats, called arrhythmias. The algorithm, detailed in an arXiv paper, performs better than trained cardiologists, and has the added benefit of being able to sort through data from remote locations where people don’t have routine access to cardiologists. People suspected to have an arrhythmia will often get an electrocardiogram (ECG) in a doctor’s office. However, if an in-office ECG doesn’t reveal the problem, the doctor may prescribe the patient a wearable ECG that monitors the heart continuously for two weeks. The resulting hundreds of hours of data would then need to be inspected second by second for any indications of problematic arrhythmias, some of which are extremely difficult to differentiate from harmless heartbeat irregularities. To test accuracy of the algorithm, the researchers gave a group of three expert cardiologists 300 undiagnosed clips and asked them to reach a consensus about any arrhythmias present in the recordings. Working with these annotated clips, the algorithm could then predict how those cardiologists would label every second of other ECGs with which it was presented, in essence, giving a diagnosis. The group had six different cardiologists, working individually, diagnose the same 300-clip set. The researchers then compared which more closely matched the consensus opinion – the algorithm or the cardiologists working independently. They found that the algorithm is competitive with the cardiologists, and able to outperform cardiologists on most arrhythmias. In addition to cardiologist-level accuracy, the algorithm has the advantage that it does not get fatigued and can make arrhythmia detections instantaneously and continuously. Additional authors of the paper include Masoumeh Haghpanahi and Codie Bourn of iRhythm. Additional information is available at the project website. In a recent Scientific American article entitled Springtime for AI: The Rise of Deep Learning, computer scientist Yoshua Bengio explains why complex neural networks are the key to true artificial intelligence as people have long envisioned it. It seems logical that the way to make computers as smart as humans is to program them to behave like human brains. However, given how little we know of how the brain functions, this task seems more than a little daunting. 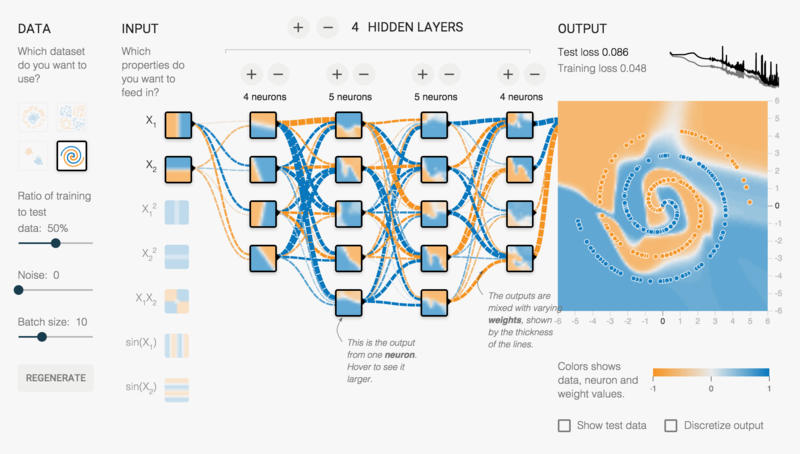 So how does deep learning work? This visualization by Jen Christiansen explains the basic structure and function of neural networks. Evidently, these so-called “hidden layers” play a key role in breaking down visual components to decode the image as a whole. And we know there is an order to how the layers act: from input to output, each layer handles increasingly complex information. But beyond that, the hidden layers—as their name suggests—are shrouded in mystery. 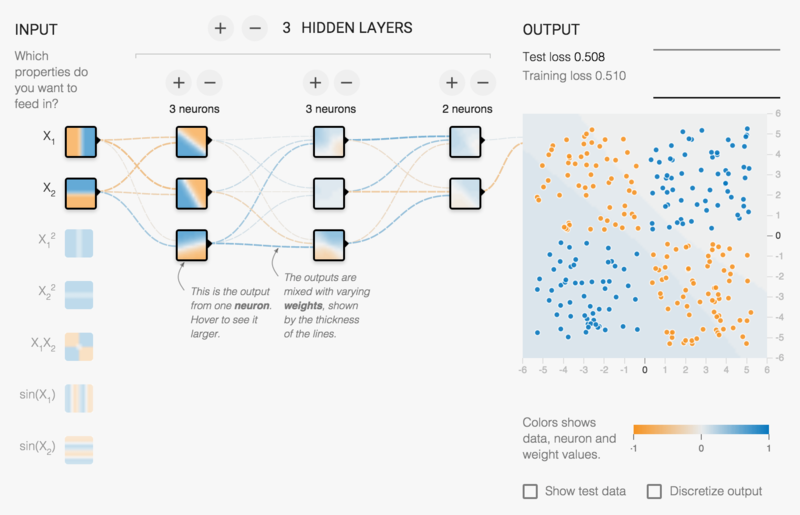 As part of a recent collaborative project called Tensor Flow, Daniel Smilkov and Shan Carter created a neural network playground, which aims to demystify the hidden layers by allowing users to interact and experiment with them. Click the image to launch the interactive [in the original article]. 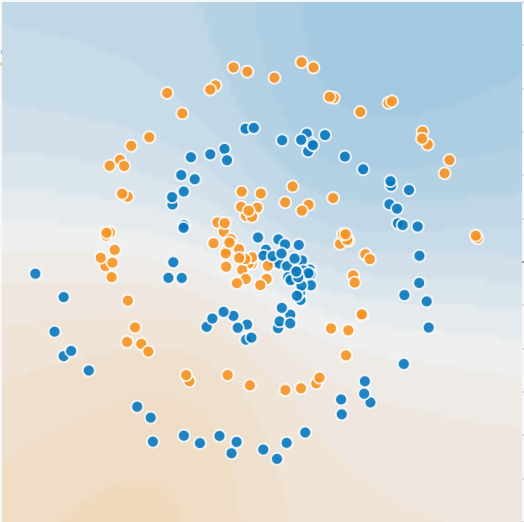 Rather than something as complicated as faces, the neural network playground uses blue and orange points scattered within a field to “teach” the machine how to find and echo patterns. The user can select different dot-arrangements of varying degrees of complexity, and manipulate the learning system by adding new hidden layers, as well as new neurons within each layer. Then, each time the user hits the “play” button, she can watch as the background color gradient shifts to approximate the arrangement of blue and orange dots. As the pattern becomes more complex, additional neurons and layers help the machine to complete the task more successfully. The machine struggles to decode this more complex spiral pattern. Besides the neuron layers, the machine has other meaningful features, such as the connections among the neurons. The connections appear as either blue or orange lines, blue being positive—that is, the output for each neuron is the same as its content—and orange being negative—meaning the output is the opposite of each neuron’s values. Additionally, the thickness and opacity of the connection lines indicate the confidence of the prediction each neuron is making, much like the connections in our brains strengthen as we advance through a learning process. Interestingly, as we get better at building neural networks for machines, we may end up revealing new information about how our own brains work. 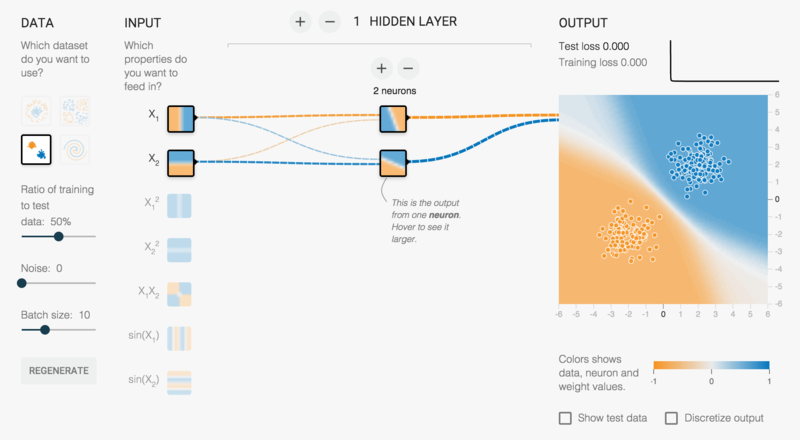 Visualizing and playing with the hidden layers seems like a great way to facilitate this process while also making the concept of deep learning accessible to a wider audience.